`Coloring is not just for kids. Join us for relaxation, fun and fellowship! Classes begin on January 8th, and will be on the 2nd and 4th Tuesdays of each month. No experience required! Occasional instruction will be offered as needed. Morning class will be from 11am to noon. The evening class will be from 6pm to 7pm. This class is for artists and aspiring artists 15 and up, and is $3 to attend or free if you are a Community Center member. Pictures, books and supplies are provided or bring your own, and light refreshments will be served. 1) Stress Relief - Stress is the leading cause of disease around the globe. It is associated with Heart Disease, Stroke, High Blood Pressure, Obesity and Diabetic Symptoms. It's a physical reaction to your thought process. Easy solution? Start coloring! 2) Artistic Accomplishment - Let's face it... we are not all crafty-types but that doesn't mean you can't create something artsy and beautiful. Coloring can give you that sense of artistic accomplishment. 3) You Deserve a Break - Even if it it's only for a few minutes, get lost in something simplistic. Coloring is simple but the results can be grand. It can give you a brief escape from the daily stress of responsibilities. 4) Great Time Filler - Ever sit in a waiting room for something and have your stress level climb the ladder to your boiling point? What if you had your colors with you? 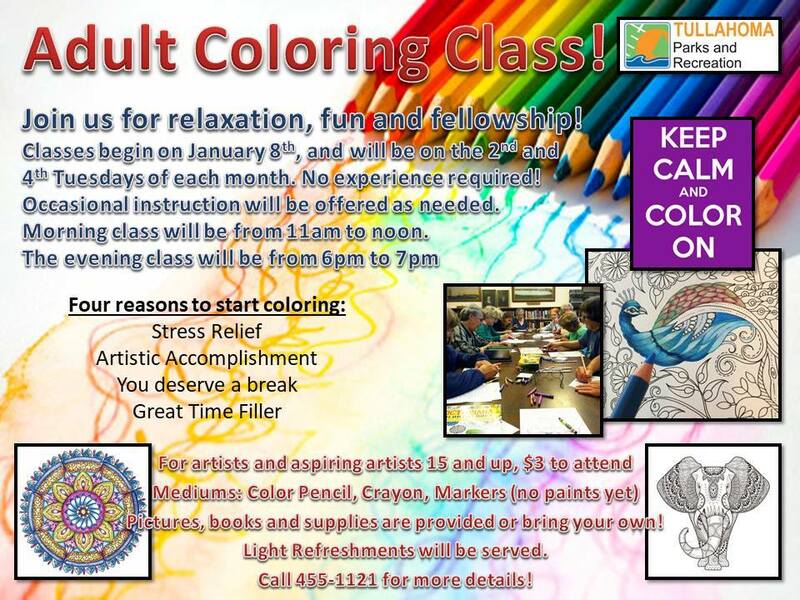 Coloring is an alternative to having your stress level get out of control. Knitters and crocheters have been doing this same trick for years! It can keep your mind focused and you get cool picture out of the deal! Call 455-1121 for more details!